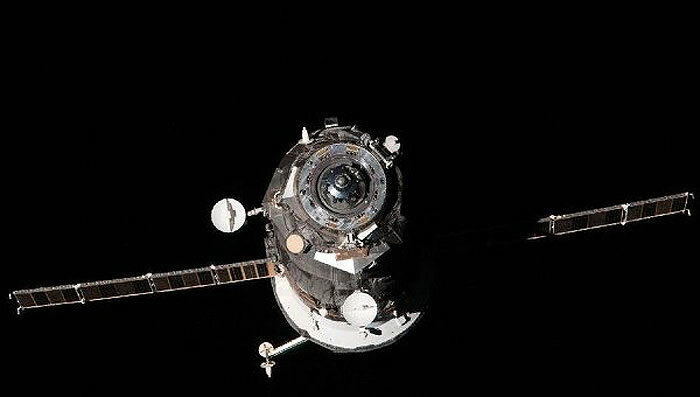 A Russian cargo spacecraft performed an accelerated docking with the International Space Station (ISS) on Wednesday just under six hours after liftoff from the Baikonur Space Center in Kazakhstan, a spokesman for Mission Control outside Moscow said. A Soyuz-U launch vehicle carrying the Progress M-17M spacecraft lifted off at 11:41 a.m. Moscow time (07:41 GMT). “The docking was carried out in automated regime as scheduled,” the official said. The freighter delivered about 2.5 metric tons of supplies, including fuel components, oxygen, food, water and scientific equipment, to a six-man Expedition 33/34 crew onboard the orbital station. Follow-up activities, such as hatch opening, deactivation of the vehicle, and cargo transfers will be performed later in the day. The mission marks the final delivery of cargo to the ISS this year. It was the second successful attempt to test the concept of shortening the time span between launches and dockings of Russian spacecraft to the ISS from the usual 50 hours to just six hours. The first accelerated rendezvous with the orbital station was performed by the Progress M-16M space freighter in August. Russian experts believe that the same type of maneuver could now be performed using a manned Soyuz spacecraft as early as in March next year, when the Soyuz TMA-08M voyage to the ISS is expected. Russia's Mission Control Centre has adjusted the orbit of the International Space Station (ISS) to avoid a possible collision with a fragment of the U.S. communications satellite Iridium-33. "The orbit was corrected at 03:08 Moscow time by means of the engines the Progress M-16M transport ship. The engines operated for 406 seconds to give the ISS an impetus of 0.5 meters per second. As a result, the station's orbit was raised by one kilometer," the Mission Control Centre said. In February 2009, Iridium-33 collided with the Russian military communications satellite Cosmos-2251. The collision produced 600 fragments of five centimeters in diameter and several thousands smaller fragments, Kazinform refers to Itar-Tass. It is next to impossible to predict the trajectory of such small objects well in advance, that is why Russian ballistic specialists said on Wednesday, after a NASA warning of a small satellite fragment approaching the station, that there was no potential threat of the Iridium-33 fragment colliding with the International Space Station. The Mission Control Centre however did not exclude that the ISS orbit correction might be needed. The decision to adjust the orbit was taken by midnight. ISS orbit is regularly adjusted in the automated mode in line with the program of the Mission Control Centre. Today's adjustment was the 15th off-schedule correction of the ISS orbit to avoid collision with space debris. The last such operation was carried out in January 2012. Currently, more than 13,000 objects measuring 20 to 30 centimeters and tens of millions pieces of debris smaller than one centimeter are orbiting around the Earth at speed of up to 10-15 kilometers per second. A collision with a space object of about ten centimeters in diameter might be equal to a collision with a loaded KAMAZ truck running at a speed of 80-100 kilometers per hour. The current crew of the International Space Station includes three Russian cosmonauts - Oleg Novitsky, Yevgeny Tarelkin, and Yuri Malenchenko, NASA astronauts Sunita Williams, Kevin Ford, and astronaut Akihiko Hoshide of the Japanese space agency JAXA.